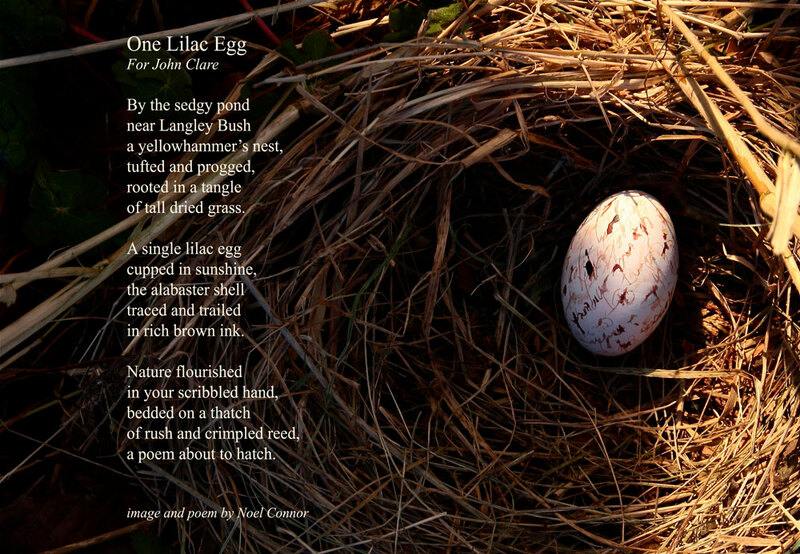 An installation of images and new poems in response to the work of John Clare. The John Clare Cottage Museum, Helpston, Cambridgeshire. Noel has long been an admirer of John Clare, and is very familiar with the village of Helpston where the poet was born. He has a long connection with the surrounding area as two of his sisters moved their families there from Belfast at the height of the ‘troubles’ in the 1970’s. He has also lived and worked locally at various times. A large extended family now live within a few miles of Helpston, and close relatives are buried in Northborough near Clare’s cottage, creating an even deeper connection with the poet. Being given the opportunity to view Clare’s archive at Peterborough Library had a profound effect and stimulated this body of work. He was moved to discover such a fragile collection of manuscripts. At times the poet’s extreme poverty resulted in him working on bits and pieces of paper that were no more than ‘scraps’. He also made his own ink from a toxic recipe that has since eaten into those fragments of cheap paper, leaving a tragic record of his ‘wounded words’.